The latest thing that has the poker world talking is the news that Peter Eastgate is selling his WSOP Main Event bracelet on eBay. I was a bit sceptical when I first saw the auction page (here), as the seller is "petereastgate (0)". Personally I wouldn't bother trying to sell a friendship bracelet on eBay with a "0" rating. I know that I'm not even looking at the page unless the person has at least a fair few token 'A+++' comments! It does appear that it is legitimate though, and he is donating the proceeds to the charity UNICEF. It's hard to rag on anyone for raising money for charity. However, to me it seems almost sacrilegious to sell off the bracelet. When you think about how insanely good you have to run to win the WSOP Main Event (see Jonathan Duhamel this year...and that's only in hands that were televised! ), it's almost like you're being ungrateful that you won the damn thing! 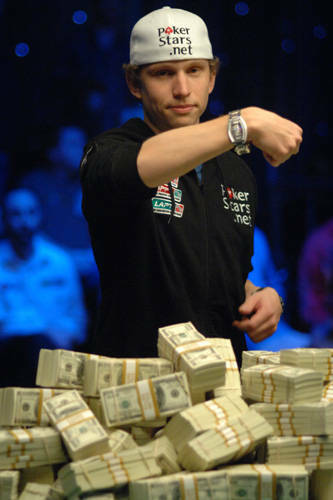 Out of the 6,843 other entrants in the 2008 Main Event field, and the hundreds of thousands of poker players around the world that wish they had such a bracelet, I bet most can't understand his decision. I would think a very small percentage of people would do the same thing. Admittedly it was reported earlier in the year that TJ Cloutier had pawned off one of his WSOP bracelets, and the pawnbroker subsequently listed it on eBay. However that was more out of financial necessity (busto!) than anything. Okay, in this case it's going to a good cause as opposed to the craps pit, but I don't buy that as enough of a reason to sell the bracelet. If Eastgate wanted to donate money equal to the amount the bracelet is likely to raise then he surely could. It seems Peter Eastgate has become somewhat disillusioned by poker, as evidenced by his retirement from poker, and therefore from his cushy role as a PokerStars Pro, earlier this year. Perhaps, as you often read about when people win the lottery, he feels his win has had a negative impact on his life, and that's the reason he is selling his bracelet. Maybe he simply wants to 'move on'. Or it could be that Peter feels his bank balance is souvenir enough of his main event win! Yet, as if selling the bracelet isn't sacrilegious enough (imo), Tony G has vowed to win the auction and turn the bracelet into a dog collar! 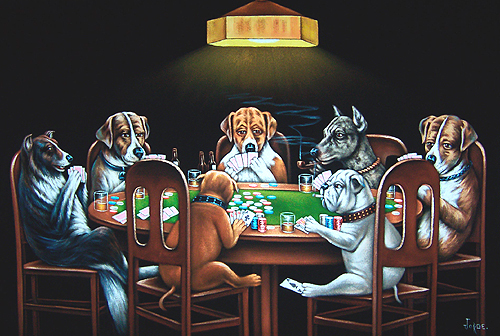 Perhaps the next "dogs in poker" painting you see will feature one of the dogs rockin' some major WSOP bling? 5 Comments to "Peter Eastgate flogs his WSOP bracelet..."
I have added your blog to my list. Can't find mine on yours er on though. I play tourney poker on Stars most nights. Nice blog. Happy to swap links with you. Kind of agree it seems a strange thing to do, am pretty sure he could just donate whatever money he makes from it to Unicef anyway, without actually having to sell something which he'd surely regret not having in years to come. Still, a nice gesture and good on him for giving to charity I guess. Am just watching Michael Mizrachi play like a crazy thing in his Poker Million heat, raising with air and blowing off his chips. Strange to think that's exactly what he did a few days/weeks later in the November Nine. At the time of watching on SKY+ he's still in though, so maybe he somehow battles back?! Anyway, just found your blog, really good read, have added it to my blog - wonder if you could do the same for mine? http://winningafortune.blogspot.comWe make selections by studying the betting market moves in horse racing. I have total respect for someone willing to sacrifice an "object" for the benefit of human life. Whether or not he has the bracelet, doesn't change the experience of winning, nor the record books. If I were in his shoes, I would have no problem letting go of a material good that is just a symbol/trophy of an event in the past, so that the money could be used for a greater good. Props to Eastgate for setting the good example of what's really important in life. And I really hope Tony wins the bracelet, I'd love to see the pics after..